Nottingham Forest owner Fawaz Al Hasawi has promised to pay any outstanding transfer fees "imminently" after the club were placed under a full embargo. 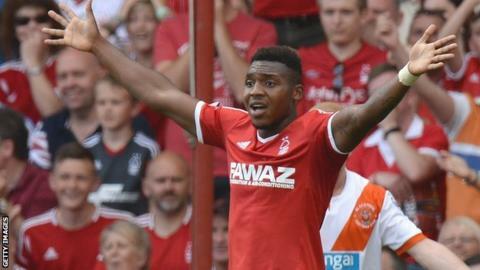 Forest failed to meet the latest instalment to Peterborough United for £5m summer signing Britt Assombalonga. Posh chairman Darragh MacAnthony called the payment a "disgrace". But Al Hasawi said on Twitter: "I can assure you any outstanding payments will be resolved imminently and our embargo situation will not change." Forest, who this week sacked Stuart Pearce as manager and saw chief executive Paul Faulkner resign, are already under an embargo from the Football League because of breaching Financial Fair Play rules. That imposition does not prevent them from bringing in loan players, subject to certain restrictions. But an automatic ban on registering any new player follows when a club defaults on a transfer payment. Once the missed payment is resolved, that ban will be lifted. MacAnthony was furious with the delay, which he said meant Peterborough did not have the financial clout to add to their squad before deadline day. He said on Twitter the situation was a shambles, but added the club would look to make signings when the loan market opened next week.